All of the seats in the new Santa Clara 49ers stadium are now available to existing Candlestick season ticket holders, and as promised, they all require a Stadium Builder License. That's the bad news. The good news is that they are no longer calling them Stadium Builder Licenses. At least the San Jose Mercury News, the good good friend of the San Francisco 49ers isn't. 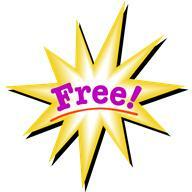 They are now called either "seat fees", "license fees" or "one-time fees". 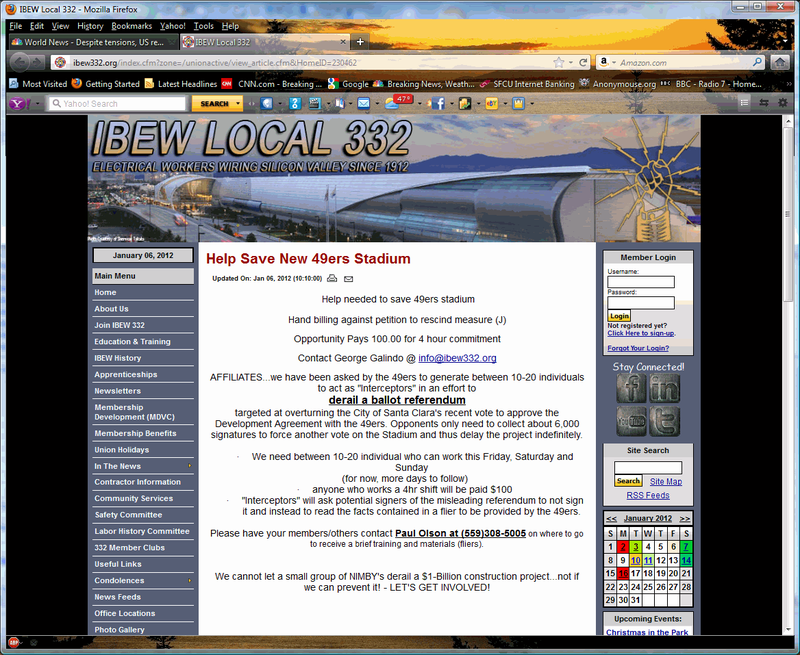 Stadium Builder License lets the buyer know they are helping to fund a billion dollar stadium. But, what if buyers become unhappy that a team worth a billion dollars, owned by a billionaire is asking fans to pay the largest share of the stadium costs which are funneled tax free to the team via the Santa Clara Stadium Authority? Well, then clearly it's time to retire Stadium Builder License as a term and move on to seat fee, license fee and one-time fee. The San Jose Mercury News warns fans that only "very limited" amounts of tickets will be available on a per game basis, being sold by season ticket holders. They also warn that those prices will go for more than the per-game season ticket holder price, and claim that on third-party sites they could go for well over face value. However, a 49ers fan who posts as "Duckfan" on their message board studied the situation with Dallas Cowboys tickets on StubHub.com and found that StubHub prices for Cowboys games in their new stadium (financed with Personal Seat Licenses) went for below face value. 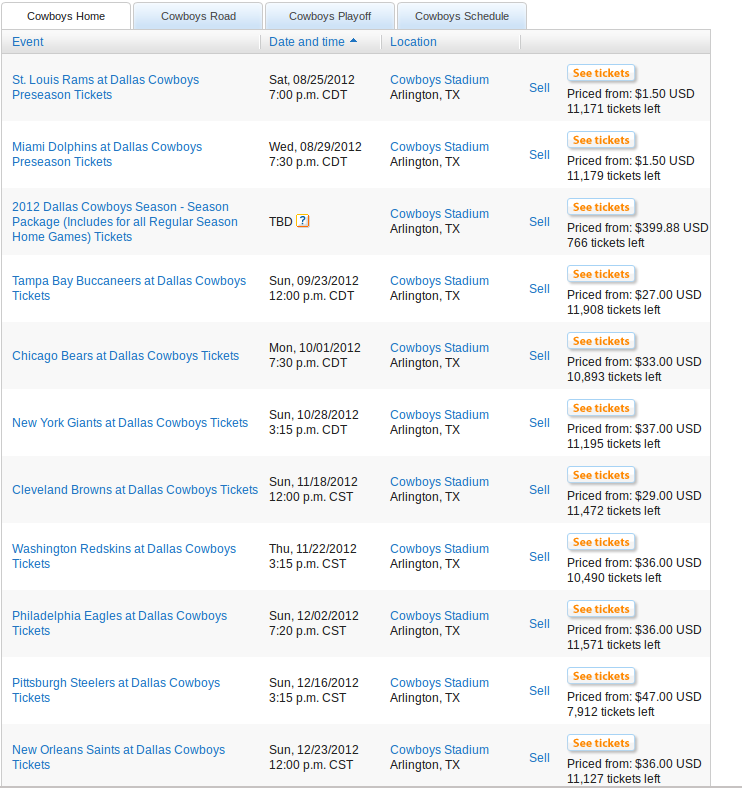 In addition to individual game tickets, StubHub.com also shows 766 Dallas Cowboys 2012 season tickets available from $399.88 on 6/10/2012. In a March 14, 2012 newspaper article, the San Jose Mercury news once again incorrectly reported on the Santa Clara San Francisco 49ers stadium deal. The usual suspect, Howard Mintz says "But they failed in a bid to block the project from going forward when a judge shot down a lawsuit that sought to force another vote on the stadium deal." There was no lawsuit to force another vote on the stadium. There was a signature drive that collected more than the required City of Santa Clara registered voter signatures to force a vote on the details of the stadium deal that were arranged AFTER the June 2010 vote and differed significantly from what was presented on 49ers campaign propaganda and in the ballot pamphlet. However, the Santa Clara Stadium Five had the city sue the signature gatherers to stop a revote. So the Los Gatos judge wasn't ruling on a lawsuit to stop the stadium, he was ruling on a lawsuit to stop a vote on the stadium deal. But stopping a lawsuit sounds a lot better than stopping a vote of the people. A vote of the people on a backroom deal worked out between a sports team that advertises in their newspaper, and a handful of corrupt politicians. Subtotal $1.049B 1.020B Up $29M Reflects DBA and increase in design/etc. Projected construction period revenues $162M $20M Not guaranteed but supported by results to date. 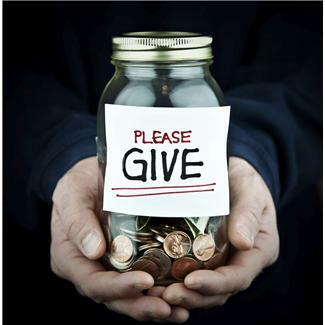 Stadco Loan funds any shortfall. A judge appointed by Arnold Schwarzenegger in 2006 has ruled that all the modifications to the San Francisco 49ers stadium agreement that went on between the city of Santa Clara and the Niners AFTER the Measure J election were unchallengable by Santa Clara citizens. He called those negotiations, which changed the terms of the stadium deal from what was presented in the Niners 5 million dollar propaganda blitz and what was placed in the Measure J ballot pamplet, something that was administrative. And apparently he feels that the citizens of Santa Clara can't challenge anything city officials do that falls into the category of "admininstrative acts". Gideon Yu - New Face of the San Francisco 49ers in Silicon Valley? On February 10, 2012, the San Francisco Examiner reported that Gideon Yu had purchased a portion of the San Francisco 49ers. Yu was also promoted from Chief Strategy Officer (a position he attained in April of 2011) for the San Francisco 49ers, to President. Although the terms of the deal were not given by the 49ers, NFL sources told the newspaper that the amount was 1% of the team for $8.5 million, and that Yu can buy up to five percent of the team in the future. While this only gives Yu - a Korean immigrant turned Silicon Valley millionaire (Yahoo, Facebook, YouTube) - a token ownership of the team, it will no doubt help team marketing in Santa Clara County where Internet millionaires abound and 50% of the households speak a language other than English at home. Yu and the 49ers are now free to refer to him as "co-owner" (as the headline from the San Francisco Examiner does), leaving out the fact that it is only a very minor 1% stake. In fact, it is possible that the "co" will be dropped in the future, as has happened with other professional sports team minority owners such as Al Davis, who did not own a majority of the Oakland Raiders until 2005 but was referred to as the "Raiders owner" for decades. 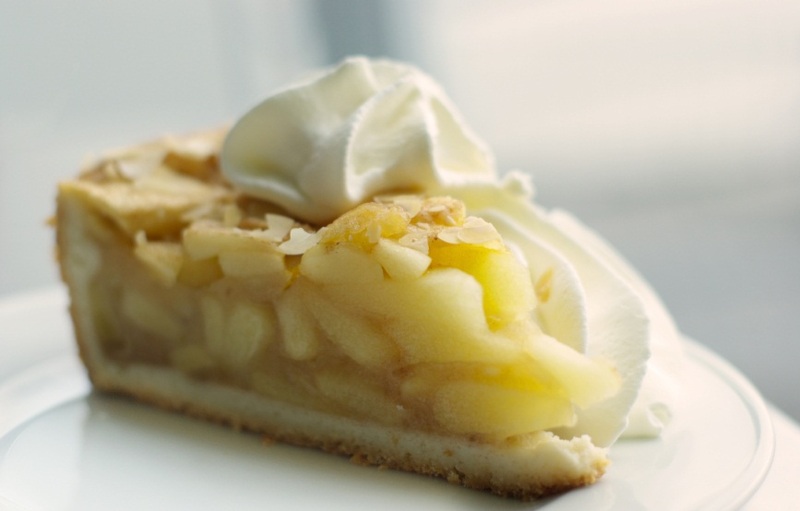 No one knows more about tax shelters and avoiding taxes than a billionaire. And when it comes to an NFL pro football team, the biggest tax break comes from getting some city to own the stadium. The San Francisco 49ers are constructing a $1,177,000,000 stadium. Annual Santa Clara property tax on that would be 13 million dollars. For 40 to 60 years, that is 520 to 780 million dollars in saved property taxes in todays dollars - and that is if they only own the building and lease the 17 acres of land. Owning the land would create an even greater property tax amount. The Santa Clara Unified School District gets 38.4 cents of every property tax dollar and the City of Santa Clara General Fund gets 10.2 cents of every property tax dollar. This means that while Denise Debartolo York (and her heirs) save $520 million to $780 million by not owning the stadium, the Santa Clara school system loses $199.68 million to $299.52 million dollars in revenue. In addition, the City of Santa Clara General Fund loses $53.04 million to $79.56 million in property tax revenue due to the San Francisco 49ers not owning the stadium. Other losers include Santa Clara County ($93.6 to $140.4 million), West Valley-Mission College District ($57.72 to $86.58 million), and the Educational Revenue Augmentation Fund ($82.68 million to $124.02 million). 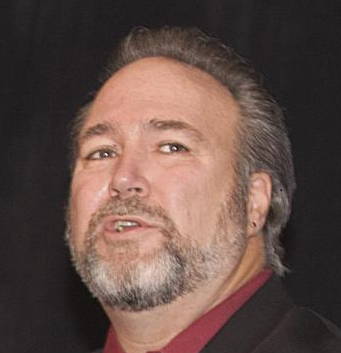 When the Santa Clara Stadium Authority was only supposed to contribute $330 million to the stadium construction (pre-election term sheet), it was said that ALL of that money would be gained from the sale of Stadium Builder Licenses, Naming Rights, charges for rights to host concession stands (Pouring Rights) and other fees. However, the San Jose Business Journal reports that the 49ers have given a presentation showing SBL revenue will be $500 million. If the San Francisco 49ers were the recipient of those charges, they would be added to their income. And since they are profitable every year, that would mean taxes would need to be paid on the $500 million (likely more) received from fees and charges related to the stadium. 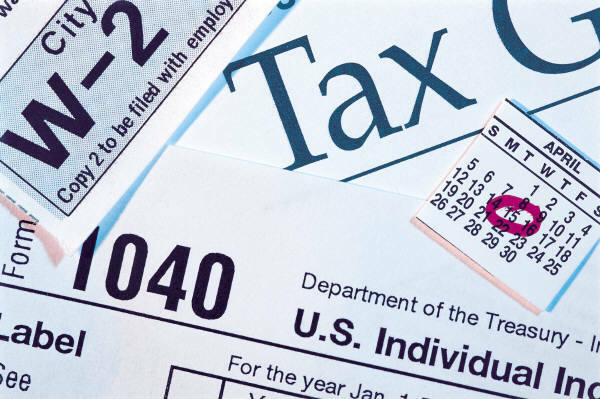 The current corporate US Income Tax rate for income over $18,333,333 dollars is 35% (for income under $18,333,333 it is essentially the same). So $500 million dollars in fees taxed at 35% would be $175 million dollars in income taxes, but the San Francisco 49ers are saving all that (and the US Treasury is losing an equivalant amount) by having their stadium charges funneled through the tax free public entity called the Santa Clara Stadium Authority. California's corporate tax rate is 8.84%. 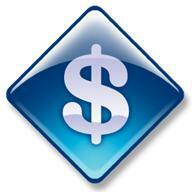 The effective state tax is (lower due to state tax deductibility on federal filing) 5.746%. So the 49ers savings on State of California income taxes are at least 28.7 million dollars. That would make their total income tax savings at least 203.7 million dollars. In addition to the SBL fees, the San Francisco 49ers will income tax shelter the Naming Rights fees, and fees levied on the vendors who will be selling food at the stadium ("Pouring Rights"), through the Santa Clara Stadium Authority. 49ers season tickets, parking passes and luxury boxes are all a perk that goes to San Francisco elected officials and bureaucrats as reported by NBC Bay Area on February 5, 2012. The city is using a sneaky way to get around laws pertaining to gifts to politicians, that has no doubt already been communicated to the Santa Clara Stadium Five. Knowledge of this tactic might even be a significant reason for the zeal of the Stadium Five in courting the San Francisco 49ers to come to Santa Clara for their stadium subsidy. This is not to suggest that the San Francisco 49ers haven't made it and won't make it worth their while in other ways. Since 1987 the San Francisco 49ers Candlestick Park stadium lease has been written in such a way that a small part of the stadium - including a luxury box - are considered owned by the city and not leased to the football team. That way city officials can claim that the team isn't giving them free seats or a luxury box or parking spaces, as those seats, parking spaces and luxury box belong to the city. On February 2nd, 2012, NFL owners approved a $200 million loan to the San Francisco 49ers to help finance a new stadium in Santa Clara, California. This is the largest loan ever given to an NFL team. Under previous league rules team loans were limited to a maximum of 150 million dollars. That limit was increased during the labor negotiations with the players in the summer of 2011. The son of the 49ers owner said they could possibly start play in the new stadium in 2014, but will definitely be using it for the 2015 season. The team has hopes of hosting the next available Super Bowl in February 2016. A front page San Jose Mercury News article for Tuesday, January 31, 2012 has quotes from several long time San Francisco 49ers season ticket holders who are lamenting that they will likely not be able to help pay for the new stadium via the Stadium Builder License (SBL) program. If they don't commit to buying a Santa Clara San Francisco 49ers Stadium Builder License for the new stadium's "reasonably comparable" seat, by March 16th, they will lose their existing seats and have to put down a $500 deposit and wait in line behind other season ticket holders for seats in cheaper areas of the stadium. The "club seats" being sold now are from $20,000 to $80,000 dollars per seat. But the son of the San Franciso 49ers billionaire owner, team CEO John Edward "Jed" York, says it could be worse. According to York, the current market would have supported selling seat licenses for over $100,000 but the team chose not to do so. Jed York is apparently quite a salesman. He makes a personal pitch several times a week to prospective SBL purchasers, and was recently able to convince Bob Kinney, who is from a family that have been season ticket holders since the 1940's (Kezar Stadium), to buy two $20,000 seats when he couldn't afford the two $80,000 seats that were the equivalent to his Candlestick Park seats. Note that with the new stadium season tickets the club seats are priced much closer together on a percentage basis than their Candlestick Park equivalents. The increment is 8% then 7% going from cheapest to most expensive (15% total). The Candlestick equivalent increment is 30% and then 39% (80% total). For those 49ers season ticket holders who are thinking they might not be able to afford to help pay for the new stadium, there may be a cheaper solution. One 49er fan who posts on their message board as "Duckfan" has studied StubHub single game ticket prices for Dallas Cowboys games and says tickets in 2011 could be had all over the stadium for less than what season ticket holders are paying per game. And those are season ticket holders who also had to buy seat licenses. A 49ers club seat season ticket holder could use the 40,000, 60,000 or 160,000 dollars they would have spent on a pair of Stadium Builder Licenses, and instead buy a 64 or 65 inch TV from Best Buy ($3000 to $4000), a Bose Home Entertainment System ($2699.99) and still have money left over for several overseas vacations and/or a new car. 40 year 49ers season ticket holder David Langtry (pictured above right) even voiced the previously unthinkable. He is considering switching to being an Oakland Raiders fan after the new stadium is built. The 49ers might not mind though, since they will be courting the Raiders to sub lease the stadium from them. And if that happens, the 49ers will no doubt want their tenant, the Oakland Raiders, to sell a lot of tickets to fans like Langtry for the games the Raiders play in the 49ers Santa Clara stadium. The long time 49ers season ticket holders upset that the club seat licenses will price them out of season tickets in a good part of the stadium, need to keep in mind one of the most precious of modern American Dreams - a billionaire using public funds and public ownership to both construct a private playground for the rich and powerful, and also protect them from having to pay large amounts of property and income taxes. And when the billionaire can't get all the funds to construct a new stadium from the public, he or she must then look to season ticket holders. Santa Clara Mayor and Stadium Five vice president Jamie Matthews was at the annual Silicon Valley/San Jose Business Journal Economic Forecast event on January 20, 2012. The Business Journal reports that he said that the Santa Clara San Francisco 49ers stadium was "definitely designed" for two home teams, and the various reports and plans were done "to make it as easy as signing an additional lease". He said discussions with another team could start after the stadium is built. He added that "We designed it for a second team, so it's our ambition to get a second team". The propaganda for a public subsidized and billionare tax sheltered stadium in Santa Clara doesn't talk about the Oakland Raiders in the stadium since it gets San Francisco 49ers fans mad, but that is who is being referred to as "second team". And although Matthews implies that he would be involved in getting the Raiders, the city of Santa Clara, while owners of the stadium through the Santa Clara Stadium Authority, has no involvement in the addition of a second team to the stadium. The second team would lease the stadium through the San Francisco 49ers affiliate Forty Niners Stadium, LLC and it is the sole decision of the San Francisco 49ers as to whether to rent to a second team. At their 1/24/2012 meeting, the Stadium Five of the Santa Clara city council voted against acting on the petitions that were collected asking for the current DDA agreement to be rejected or re-voted on. The Santa Clara Country Registrar of Voters has notified the City of Santa Clara Clerk that the two petitions submitted by Santa Clara Plays Fair for referendums related to the San Francisco 49ers stadium, have passed a sample count. They estimate that 5,082 valid signatures were collected for the DDA related petition and 5,142 valid signatures were collected for the petition related to the stadium financing financial agreement. The effort to get a revote on the Santa Clara stadium deal due to the drastic change in conditions from what was presented in the ballot pamphlet and what was actually agree upon, has concluded. More than the required number of signatures have been collected but they must now be checked for validity. There were actually two petitions circulated, one with regard to the DDA and one with regard to financing. There were 5,474 signatures collected with respect to the first issue, and 5,563 collected for the second. They were turned into the city of Santa Clara at 3:00pm Wednesday afternoon, January 18th, 2012 and the city clerk's office reviewed them for seven and a half hours. The signatures now need to be audited by the Santa Clara County Registrar of Voters to ensure that there are the required number of valid signatures (approximately 4,500). The audit process will take from 5 to 30 working days. San Jose resident and San Jose Mercury News employee Scott Herhold took the time to shill in the San Jose newspaper for the San Francisco 49ers and their plans to play at a stadium subsidized and tax sheltered by the city of Santa Clara. In a shameful piece Herhold refers to concerned Santa Clara citizens gathering signatures for a revote on the stadium as "snake oil salesmen". To the contrary, the signature gatherers have signs and literature that clearly show why they are collecting signatures - the terms and financial agreements voted on are not the same as those of the final agreement. Ironically, the people that Herhold is trying to protect are the snake oil salesmen - the Santa Clara Stadium Five and the San Francisco 49ers and their front group. Those very people who did not disclose any costs in the lengthy ballot measure question, and carefully chose not to mention the San Francisco 49ers, referring to them as a "private party". 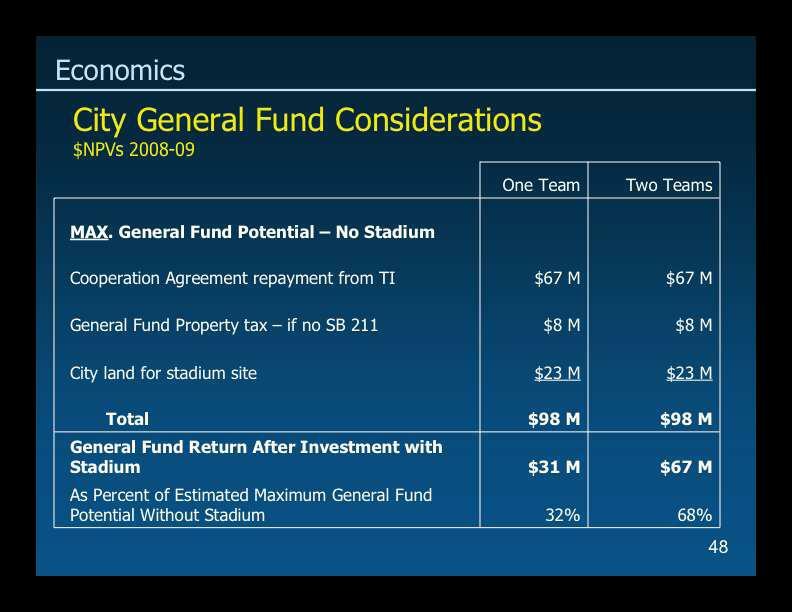 Those very people who did not disclose that the stadium would cost the city General Fund $67 million dollars as was shown in a City of Santa Clara staff presentation. Those very people who wrote the ballot question as an advocacy piece for the San Francisco 49ers. Those very people who put a non-binding term sheet into the ballot pamphlet as if it represented the final terms of the city's subsidy for the 49ers. Those very people who now want Scott Herhold to pretend that the people upset about the way the terms of the agreement have changed drastically from what was put in the ballot pamphlet are the deceptive ones. Herhold advises Santa Clara residents from his home in San Jose to "just say no" to a revote on the stadium. He mentions that this is what we tell kids with regard to drugs, gamblers craving a bet and parents who yearn for chocolates after dinner. Herhold's analogy of just saying no to these temptations is like his charge of "snake oil salesmen", EXACTLY BACKWARDS. With drug use, gambling and eating sweets - the pleasure is immediate and the pain comes down the road. Just like with a stadium. People voting yes are eager to brag about being in a city with a football stadium, and disregard the long term consequences of owning a stadium. Long term consequences like the fact that they don't make money. Which is why the San Francisco 49ers don't want to own the stadium. In the case of the city of Santa Clara, they have a unique long term consequence in that it will cost the General Fund $67 million in redevelopment agency repayment money as shown in a City of Santa Clara slide presented to the city council. 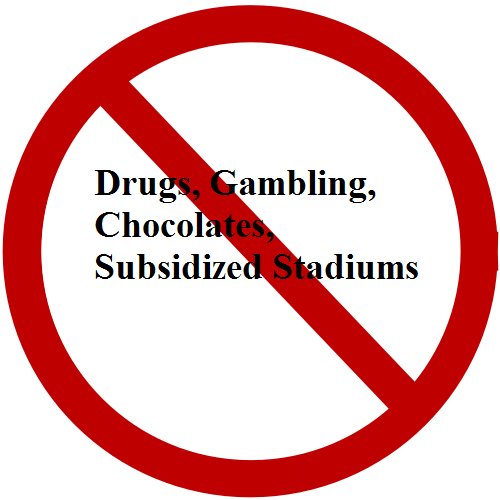 So city residents should "just say no" to the temptation of owning a stadium. Herhold claims that there was a big fight in which 49er opponents "threw everything but the kitchen sink at the idea". Once again, Herhold has it wrong. The opponents of the stadium had only enough money to send out one postcard during the entire campaign. One postcard. The 49ers spent over four million dollars sending out countless glossy brochures and broadcasting TV commercials. This wasn't a situation where both sides had equal amounts of mailings and TV commercials and the voters of Santa Clara made up their mind based on hearing from both sides. To the contrary - the greater than 200 to 1 disparity in spending between the two groups ensured that only one message got out, the one from the San Francisco 49ers and the Santa Clara politicians who got in bed with them. How many Santa Clara residents know that the city's General Fund will lose $67 million in repayment money that was loaned to the Redevelopment Agency if the stadium is built? They didn't hear anything about that from the 49ers. Instead they were repeatedly told that a 10 to 20 events a year stadium would create thousands of jobs. In reality it creates only hundreds of jobs. But not full time jobs. Part-time temporary minimum wage jobs that wouldn't even fund a Comcast digital cable subscription for the year. Far from a big fight, what took place was a one-sided propaganda campaign financed by a sports team with plenty of money to inundate the voters of a city of 120,000. The San Francisco 49ers bought an election. The first poll taken after their massive mail and TV assault began still had the stadium losing. Every subsequent poll reflected that the lies and deception were working as the number of yes votes increased each time. Herhold says that "you can question any loan" but that in this case it is not questionable because Jamie Matthews told him there is no problem. The same Jamie Matthews who saw the city of Santa Clara presentation which showed building the stadium costs the General Fund $67 million dollars in lost repayment money and yet claimed in 49ers campaign literature that there would be no impact to the General Fund from the stadium. Herhold says that Santa Clara voters need to trust their "representational government" on the ins and out of a complex loan since they are busy people with their own "household problems". Since the Ballot Pamplet had all kinds of details about the financial terms of the agreement between the city of Santa Clara and the 49ers, it is clear that Herhold is in the minority with respect to how much information voters need and want. And while Herhold advises to just trust the politicians on the stadium, when it comes to the California High Speed Rail on which voters voted and passed he's not trusting the politicians. Which is it Scott, do we vote yes and trust (Santa Clara Stadium) or do we vote yes and not trust (High Speed Rail)? Herhold suggests that if you don't like the work of the city of Santa Clara politicians you should just "throw those rascals out". That is, after you have quietly allowed them to get in bed with the 49ers and completely change their stadium subsidy deal from what was put in the ballot pamphlet that you used to determine your vote. After all, every politician in the CITY NEXT DOOR is entitled to some "rascally behavior" in a democracy. Do we have that right Scott? Former KPIX (CBS Channel 5) meteorologist and current KSFO (560 AM) talk show host Brian Sussman has been a long time 49ers season ticket holder. After hearing what the ticket prices would be for the new stadium, he decided to take a deeper look at the financing for it. His conclusion is that the stadium is a great deal for the San Francisco 49ers, but bad for 49ers fans and Santa Clara residents. He says "This plan must be stopped!" Sussman will be at the Save Mart on El Camino Real in Santa Clara on Friday, January 13th talking with signature gatherers. The Santa Clara Stadium Five had the voters vote on a non-binding term sheet and then radically changed the terms of the deal when it was finalized. A classic bait and switch move. Clearly the voters of Santa Clara need an opportunity to vote on the actual deal with the San Francisco 49ers. 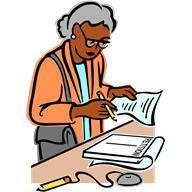 To do so requires signatures to be gathered so a referendum can be placed on a ballot. The signatures have to be collected by January 18th, 2012. There are people collecting signatures each day from 3pm to 7pm at the Save Mart at 2610 El Camino Real in Santa Clara (in the shopping center at the southeast corner of the intersection of El Camino and Kiely/Bowers). As reported in the Saturday, January 7, 2012 edition of the San Jose Mercury News, the 49ers have asked the local International Brotherhood of Electrical Workers Local 332 to provide 10 to 20 people to act as 'interceptors' who will be paid $100 for 4 hours work. 'Interceptor' is a codeword for someone who will intimidate the people trying to gather signatures to put the stadium back on the ballot and those whose signature they are seeking. Since the terms of the stadium deal have changed so drastically from what was presented to voters in June of 2010, a revote is clearly in order so voters can approve the actual terms and conditions, not the sales pitch that was railroaded into the June 2010 ballot. However, the 49ers are against this democratic vote. But of course that was already displayed when they (aided by the lies of the corrupt Stadium Five) flooded the City of Santa Clara with over $4 million dollars worth or propaganda in the run up to the stadium vote. Hopefully the hired thugs of the Brotherhood will not cause physical harm to Santa Clara citizens as they seek to stop the democratic process. It is no wonder then that outraged citizens are working to get a revote on the stadium. A vote in which the voters will be presented with actual financing, not the sales pitch financing. The City of Santa Clara has inexplicably been escorting San Francisco 49ers buses to the airport since 2007 - and for free. When this was discovered by a Santa Clara citizen, the city did some tap dancing. 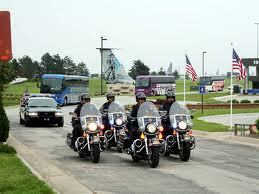 First, the city's extremely well compensated police chief Steven Lodge said that it had only happened in 2009 and 2010. 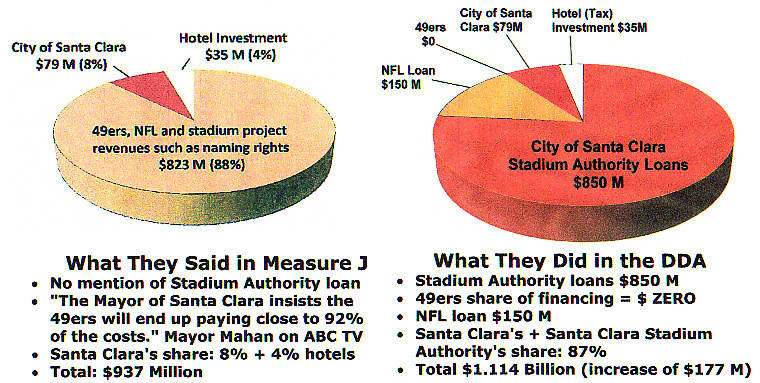 Second, he claimed that it would be repaid once the Santa Clara Stadium Authority was formed. The problem for Steven Lodge and city officials - is that it ultimately came out that the free escorts started in 2007. The Santa Clara Stadium Authority wasn't approved till a vote in June 2010. You can't agree to pay in 2007, an entity that may never exist. Sadly, it's clear that the city and football team had no arrangement whatsoever for payment for these needless police escorts, whose sole purpose is likely to let police officers rub shoulders with their football playing heroes. Talk of payment only came when the practice came to light to the general public. More sad evidence of how in bed city officials are with this professional football team. So deeply entangled, that they waged a campaign of lies in order to give the football team public funds and a huge property tax break, all at a cost of $67 million to the city's General Fund. So deeply entangled that the San Francisco 49ers pay less than $2,000 a month to rent 11 Santa Clara acres in extremely expensive Silicon Valley. And this sweetheart rent, originally granted in 1988, will now continue for another 40 to 60 years as a result of the deal the city cut with the football team as part of the June 2010 election.